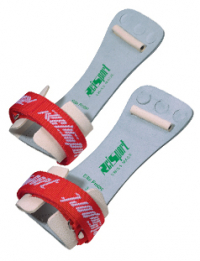 The REISPORT gymnastics high bar grip is constructed with three finger holes and a small rubber dowel. 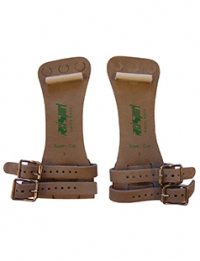 The gymnastics grip is available in two styles - threaded with double buckle closure for greater wrist support, or a Velcro wristband for a broad range of adjustment options. XS - Up to 6 1/2" Small - 6 1/2" - 7" Medium - 7" - 7 1/2" Large - 7 1/2" and up To clean your grips: A grip brush is recommended to remove excess chalk; do not use water. REISPORT ELITE PROTEC gymnastics high bar grips have three finger holes and are manufactured from a leather laminate that is triple the strength of ordinary leather and stretches less than 1%, compared to 4% for natural leather. These qualities combine to form a durable, longer lasting grip that offers gymnasts maximum reliability when performing the most difficult moves on the high bar. XS - Up to 6 1/4" Small - 6 1/4" - 7 1/4" Medium - 7 1/4" - 8" Large - 8" - 8 3/4" XL - 8 3/4" and up To clean your grips: A grip brush is recommended to remove excess chalk; do not use water.